Milder spring weather is an irresistible draw for Canadians to get outside and enjoy the reawakening of nature. Little ones love to get in on the springtime fun, which makes it a perfect time to indulge preschoolers in some seasonal activities outdoors — and indoors on rainy days! Preschoolers love to be creative, and there is no better time than spring to indulge budding artists by letting them draw and design outside with some colourful sidewalk chalk. 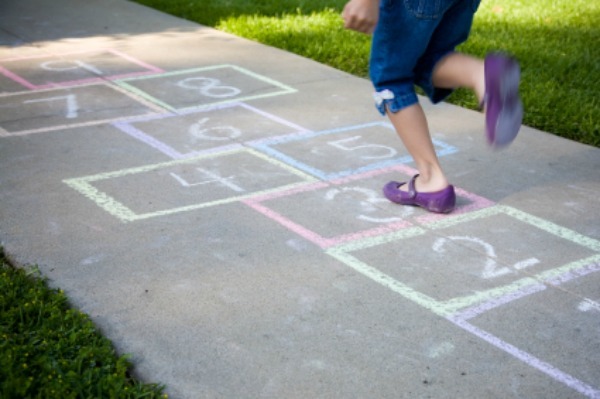 Little ones will be entertained at length, and moms can count on spring showers to come along to clean and renew the kids’ “canvas.” Try making a hopscotch on which to play together! Most children are eager to head outdoors with skipping rope and soccer ball in tow at the first sight of clear pavement or grass. For a preschooler, running around in the spring air may be exciting enough, but kicking a ball back and forth with a parent, playing catch, or beginning to learn to jump rope allows them to develop skills while having fun! Check out this classic Canadian skipping song, Teddy Bear, Teddy Bear Turn Around. Spring showers bring… puddles! Preschoolers are at the perfect age to don a raincoat and rubber boots and indulge in some old-fashioned puddle-jumping. With a little mud-pie making, or mud-puddle excavating thrown in for good measure, this is sensory exploration at its best. Mess is to be expected and should be encouraged — it will all come out in the wash! Educating preschoolers about the signs of spring can easily be disguised as out-and-out fun! Visit the zoo and observe the changes taking place, go on a nature walk, indulge in a little bird-watching, or just do some digging in the garden. Heck, it’s an adventure for a preschooler to don utility gloves and explore the yard while doing some spring clean-up alongside a parent. Kick up the fun a notch by making the session a ‘signs of spring’ scavenger hunt! The spring season brings with it frequent rainy days, so be prepared to continue your spring-themed activities indoors. Print off some spring colouring pages, make a springtime collage by cutting and pasting seasonal pictures from old magazines or newspapers, make paintings and drawings depicting spring scenes, read a book about spring together, or spend time making your own sidewalk chalk to use outside when the sun starts shining!